The Bagel In its current location (the third since 1950), this deli has managed to bring a little Jewish curmudgeonliness to Boystown. So, when you’re at the counter ordering your potato knish or hamantaschen (available in traditional flavors: poppy seed, apricot, raspberry and cherry), expect to have a brusque comment or two thrown your way. After all, the Bagel hasn’t survived all these years by being nice. 3107 N Broadway (773-477-0300). El: Brown, Purple (rush hrs), Red to Belmont. Bus: 36, 77, 145, 146, 151. Breakfast, lunch, dinner. Average main course: $11. Cookie Bar The 18 cookies on display at Cookie Bar start off chewy, with thinnish, caramelized and just barely crispy edges, and get progressively softer as you work your way to the center. This, of course, is exactly how most people want their cookies to be. 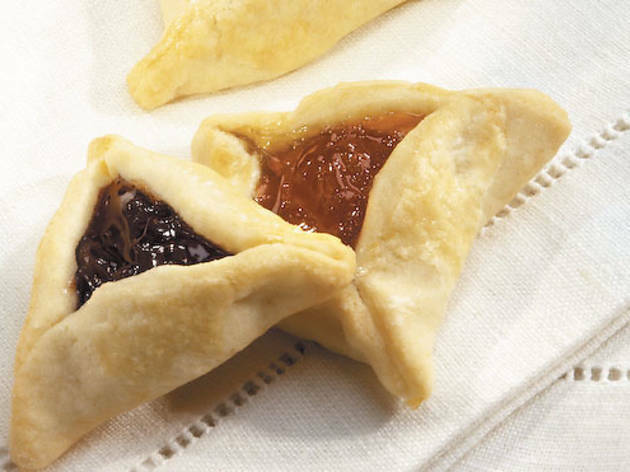 People also usually prefer good quality chocolate (Cookie Bar uses Callebaut), and this Purim you’ll find that chocolate in the bakery’s hamantaschen. (Or not—it’s doing macadamia nut–lemon zest and poppy-seed versions, too.) 2475 N Lincoln Ave (773-348-0300). El: Brown, Purple (rush hrs), Red to Fullerton. Bus: 8, 11, 74. Lunch, dinner. Average cookie: $1.25. JB’s Deli This counter—like every good Jewish deli—is manned by workers who are gruff, efficient and impatient. The food is equally no-frills: Basic hamantaschen are available for Purim; thinly sliced corned beef is piled on high; lox platters include red onion, cream cheese and tomato, but lettuce stands in for capers (which are available for an extra charge per request); and housemade blintzes are small pockets of delicious creaminess served on paper plates. 5501 N Clark St (773-728-0600). El: Red to Bryn Mawr. Bus: 22, 36, 50. Breakfast, lunch. Average main course: $6.50. Steve’s Deli So maybe the carrots in the chicken soup here are undercooked. Doesn’t matter. People will order the soup for the good matzo balls, because a good matzo ball in Chicago is hard to find. And good sablefish? Good lox? 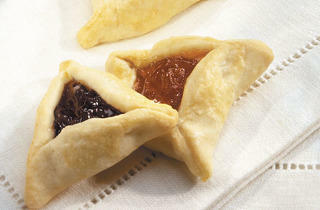 Hamantaschen for Purim? Happily, these elusive goods are also found at Steve’s. No, the bagel you put the fish on isn’t great. And this isn’t a corned-beef place, either—the beef is leaner than the economy. But all of this can be forgiven. Because what would a Jewish deli be without something to kvetch about? 354 W Hubbard St (312-467-6868). El: Brown, Purple (rush hrs) to Merchandise Mart. Bus: 11, 65, 125. Breakfast, lunch, dinner. Average main course: $8.75. Tel Aviv Kosher Bakery There’s something of a spell that comes over those who venture into this kosher bakery. You may come in determined to buy only one thing—a fluffy loaf of challah, for example. But before you know it, the aromas of cinnamon and chocolate take over, and soon you’re ordering bags of rugalach, a dozen black-and-white cookies and, around Purim, the hamantaschen, in flavors such as lemon, cherry and raspberry—some of which are made with yeast, some of which aren’t. 2944 W Devon Ave (773-764-8877). Bus: 11, 155. Breakfast, lunch. Average baked good: $2.